Normally when you clear your browser’s cache you have to fool around clicking a number of tabs and buttons to get to the place where you clear the browser’s cache. It need not be so convoluted. Nope. We’ve discovered a way to open the browser’s cache clearing dialog without so much as touching your browser’s toolbar or settings. If you’re using Internet Explorer 8 or 9, any current version of Chrome, or Firefox version 3 or better, you can get to the cache clearing dialog by pressing three keys on your keyboard. Press your Ctrl, Shift, and Delete keys at the same time. For some reason, on my computer it only works if you use the Shift key on the left side of the keyboard. It may be different on your computer. When you press the Ctrl, Shift, and Delete keys, the browser’s cache clearing dialog opens instantly and you can clear you cache quickly and easily. Now this is a tip you’ll want to pass along to your friends with dirty caches, right? does this work with windows xp? if not how do youmake this work with windows xp. Operating System doesn’t matter, it works with Internet Explorer 8 and 9, current versions of Firefox and Chrome. If you’re using IE6 or IE7 it won’t work. I am using Firefox 5.0 & the shortcut works great! Thanks so much! I tried your “Super Duper Quick Way To Clear Your Browser’s Cache”, and it did not bring up an “Empty Cache” dialog box. I did check my IE browser’s version, and it IS IE 8. I did try BOTH shift keys with the CTRL+SHIFT+DELETE, and it does bring up a dialog box but there is NO check box to “Empty Cache” listed. When you first posted this shortcut, I tried it and it’s great! 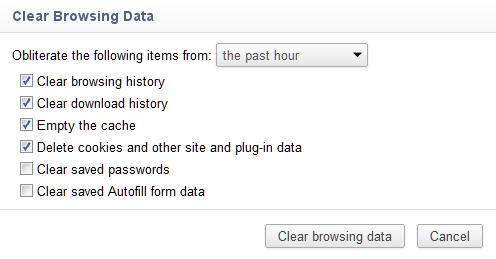 However, I’m always fooling with my toolbar options, and now I see there’s a new option, a “delete browsing history” button, which I’ve put on my toolbar. Now it’s a one-click process. I can only suppose that Microsoft adds new button options occasionally with their updates. This works for me on Firefox, but some users of our internal web portal (which I support) report it not working for them and they seem to be doing it correctly. Is there any setting or other factor that could effect it? Forgot to mention…all our users use Windows (not all same version) and Firefox (same current version). Operating systems have nothing do do with it. Nos sure why they can’t do — perhaps they’re not following instructions.